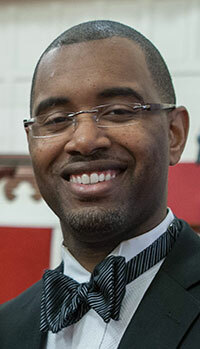 Dr. DaVaughn L. Miller serves as Director of the Appalachian State University Gospel Choir Director. The ASU Gospel Choir is a beautiful ensemble noted for singing beautiful literature taken from the African American religious experience. In addition to his service at ASU, Dr. Miller is the Music & Theatre Arts Department Chair and Director of College Choirs at Livingstone College in Salisbury, North Carolina. As a conductor, Dr. Miller has performed over 200 concerts and 15 tours spanning the east coast. Under his direction, the Livingstone Concert Choir has had performance collaborations with the Salisbury Symphony Orchestra and Charlotte Symphony Orchestra with noted conductors such as Dr. Andre Thompson, Florida State University and Dr. Uzee Brown, Morehouse College. One of Livingstone's most noted performances, under Dr. Miller's baton, was at Carnegie Hall, New York where the choir received a standing ovation, of which an open invitation to return was extended. As a native of Springfield, Massachusetts, Dr. Miller holds a Bachelor of Arts Degree with a concentration in Ethnomusicology from Hampshire College in Amherst, MA; Bachelor of Music Degree in Music Education and Masters of Music Degree in Choral Conducting from Appalachian State University in Boone, NC; and the Masters of Education Degree and the Doctorate of Education from Columbia University in New York, NY.